There are multiple reasons to start your redecking project. All of them are good ones! That shabby deck has been with your house since you bought it. Or perhaps it lost some of its glow to a terrible storm last fall. Or maybe, just maybe, the record snow that hit us in January made it look more weathered than you’re willing to deal with. Whatever the case, that deck lets you walk all over it every day if its life and you know it serves you very well. And yet, perhaps it looks too worn or even broken to keep up with the rest of the house. You don’t need to replace it completely, though; just re-deck! Redecking is the process by which you resurface a worn-but-functional deck while keeping its structure intact, making the old look new again without sacrificing what still works. This process allows for a cheaper alternative to complete replacement that lets you build on a solid foundation and make a weathered deck look like it was freshly attached to your house. In addition, any differences in structural code can often be addressed fairly easily, allowing for easy updates that can make the deck even stronger and safer. Not every deck is safe for redecking, but most are open to it in some capacity. If the footings of the deck are still sound, you have a good start to a redecking process. This is even better if the wood at the base is still strong. Preferably, the entire deck will share that strength, meaning that the majority of the deck is strong enough to stay during the rehabilitation process. Also, note the tinier details when inspecting a candidate for redecking. Every deck joist needs one or more 3/8-inch screw in order to qualify as structurally stable. If all of these qualities match up, your deck is the perfect candidate for the process. A deck is an integral part of many houses, serving many functions in the daily lives of homeowners. The deck provides a path between the house or the street, or serves as an overlook for the house’s yard. Parties and other social functions are held on decks. They also add value to a house during buying and selling and make the house look better. All of this means that when the deck starts to fade, so does the house it belongs to. It is the duty of the homeowner to keep the deck in proper order. Of course, such an integral part of the house can be expensive to repair completely. Redecking is an active middle-ground between letting the deck sit and replacing it. It provides a cheaper and less intrusive alternative to a complete replacement that allows the homeowner to keep a strong deck looking strong. There’s no need to destroy something that can still stand on its own when simple repairs can make it look new again. 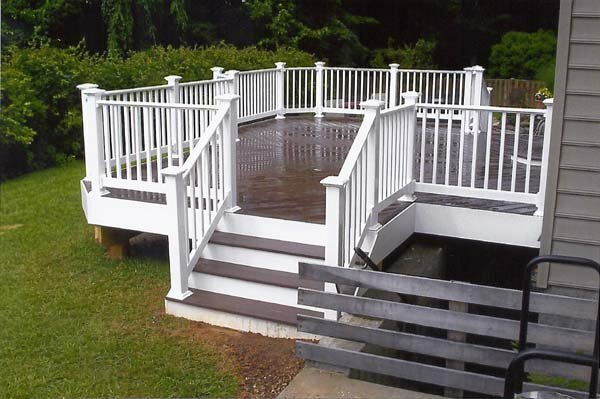 Freedom Fence and Home can help with your Redecking needs. Contact us at 443-271-6841 or visit our website, Facebook or Twitter to learn more about the process or any other home, fence, or deck work you might need. This entry was posted on Monday, February 29th, 2016	at 1:48 pm	. Both comments and pings are currently closed.